My vision for this mod is to create stock alike believable parts to build passenger planes with. 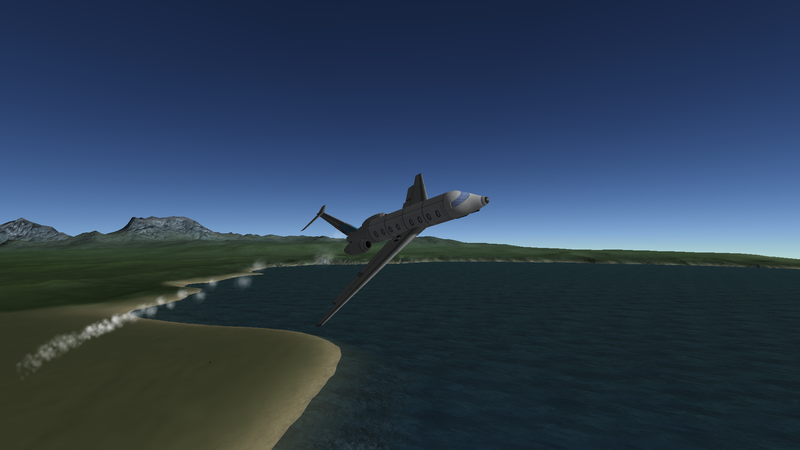 It is inspired by Airplane Plus, and will be made to supplement it as well as the stock parts. I am pretty new to modding in general, so if you have advise or suggestions you would like to offer, please do so. I do believe, however, that I have many of the skills required. My plan is to use Fusion 360 along with Blender for modeling, Gimp and Inkscape for image and graphics editing. I do know a little C++, python and matlab, which might come in handy, though I have never programmed anything with more than a command line interface, so I expect to have a few things to learn if I want to get into that side of modding. Also I want to set this up so that it is easy for someone else to take over in the case that I should disappear (knowing my self I usually don't stay focused on one thing for more than 1-2 years at a time), so any suggestions as to how to accomplish this would be welcome. Here is a little sneak peak at the work so far: https://www.dropbox.com/s/q1tyzalcbpip8fq/NeistAir.zip?dl=0 The parts are mostly functional, though I expect that I have to redo pretty much everything, so it is mostly place holder artwork for now. 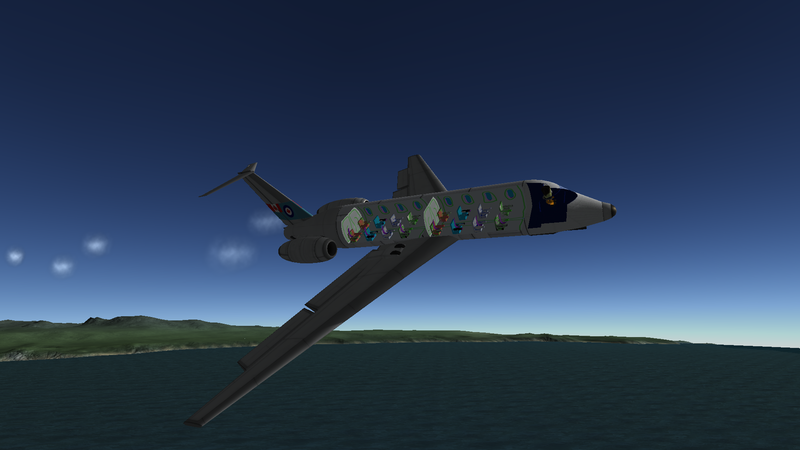 Reference image I used was supposed to be CRJ900, but I am not going for exact replica, just generic airliner cockpit. The big fuel tanks are 3.75m right? I want to be comopatible with the stock sizes, so that the parts can be used in as many combinations as possible. If you look in the concept art you can see how the 3.75 size looks. works with 3+3, 2+3+2, as well as 3+3/3+3 configurations. I am thinking it will be a A380 like cockpit for those. 3.125m is probably right for a 3+3 configuration though, nice for making 737 like aircraft. @neistridlar For the a380, I think that mk3 would be better. Also, maybe 737-like stuff should be 2.5m, as you stated that you wanted coherency with Airplane Plus. Both the mk3 and 2.5m sizes are unable to fit more than 2+2 configuration. That is why I am looking at the larger sizes. 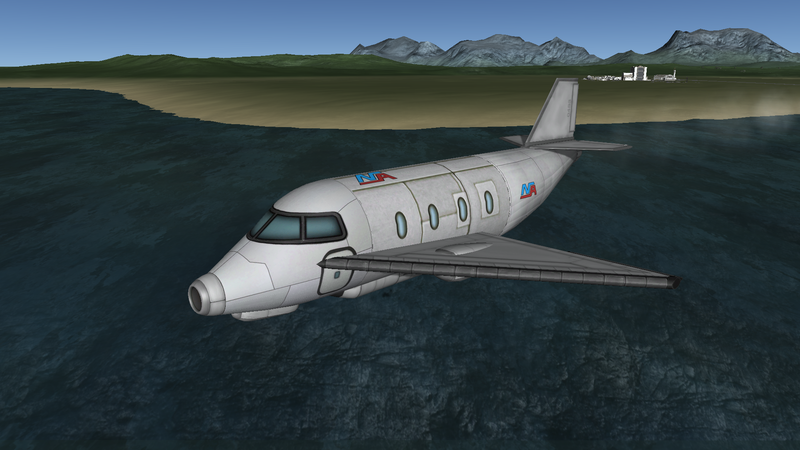 I have made some mock-ups in game with fuel tanks in stead of cabins, and Tweak scaled FAT wings. I think it looks appropriate for an A380 sized aircraft, and it still only needs two goliaths to get off the ground. Also, to begin with I want to make stuff in sizes that Airplane Plus does not offer, for the sake of maximizing variety. There is already a good amount of 2.5m parts, so it is not a priority for me. Wow, some of those larger mock-ups are insane. Anything with that many kerbals existing in an IVA at the same time will absolutely tank the frame rate, though. So I would keep to the 2-story 5m fuselage when it comes around, and make the lower half a cargo bay. A half-cargo variant of the 3.75 m fuselage would be awesome too. Even better if the cargo floor lines up with the SXT Osaul parts, but that's for the future. Yeah just opening the crew tab in the SPH with 200+ kerbals enrolled significantly slows down the game for me, and I can usually run 500 part ships just fine. I probably will not ever make that one, just wanted to see what was possible. Looking at pictures of cross sections from real aircraft suggest that the lower half of the fuselage is reserved for cargo and stuff like that, so I will probably not put the lowest floor much bellow center, and eventually have some kind of cargo bay bellow. Also, you wanted to try your hand at placing some props right? I think the cockpit is ready for that now, and I have tried to do some my self, but the seats are missing textures, and the other props don't show up when I load the part in game. Do you have a good method for sharing the files? I would love to see what you can do with them. Though I don't think it is time to put in a lot of work to get it all perfect still, just trying to get stuff to work right now. Speaking of which I got an overlay mask to work on the cockpit, but when I did the same for the passenger cabin, the overlay mask just sits on the ground next to the ship, and the overlay shader hides the wrong stuff. When I move the ship, the overlay mesh does not move with the ship, it just stays in the same place. I am in my last few weeks of classes at university while working nearly full time right now and won't be able to place any props until I graduate in three weeks.If anything changes about my availability before then, I will let you know. Lots of papers and finals right now. I can help you with any questions about Unity setup, however. For the cockpit, don't integrate your seats with the model; this will allow us to put in moving seats. This is necessary because male and female Kerbals have different eye levels, and if the view is good for Jeb, Val will have trouble seeing over the dashboard. I don't know anything about the overlay masks. Try @blackheart612, his are pretty good IIRC. For the cockpit, don't integrate your seats with the model; this will allow us to put in moving seats. This is necessary because male and female Kerbals have different eye levels. Right, I can totally see how university and placing props are incompatible right now. As for the seats I think all seats will be placed as props, since the seat transforms has to be placed manually anyways, might as well just put the seat prop as a child of that. That way you can see more easily where the seat transforms are as well. If you have any Ideas about what is going on, that would be very helpful. There's a persistent error with the seat props included in the game, which is one reason it is so much easier to bake them into the model using Blender. They show up properly in game if you edit the internal .cfg to add them manually, but I've never gotten them to work properly in Unity post KSP v.1.1. Forgot to tell you that, sorry. Blender will allow you to import your internal.mu, SeatPilot.mu, and SeatPassenger.mu. You can place the seats into your internal model that way, and export it with them included as long as the export includes the seat as a child of the interior. I think I have found the method to use for placing seats now. Each seat is child of the seat transform, so you just have to adjust the first seat in relation to it's seat transform, then copy paste the seat transform. I think it should be quite doable even for a 200 seat configuration. Also I made my own seat model, which is not part of the cabin model. It needs some work still, but it is ok for now. The interior model is also updated. The interior textures are just marginally better though. Also figured out the overlay mask issue. 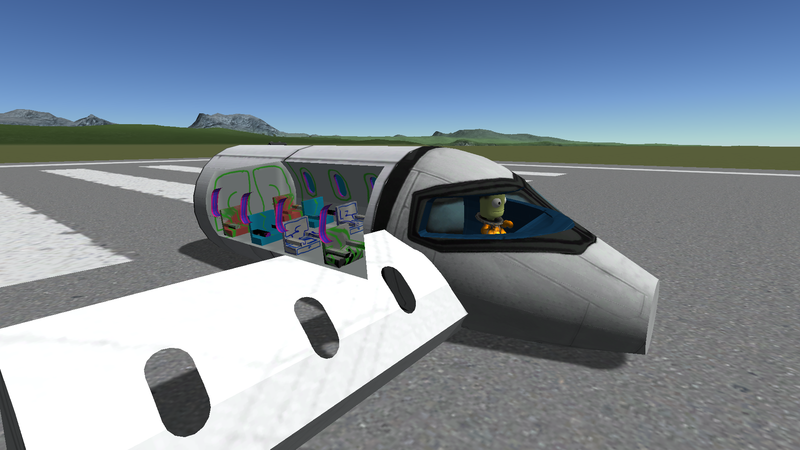 The overlay mask needs to be on the kerbal layer, or the game will just put it on the side of the runway. Added more pictures to the album in the OP. Also I will put a new sneak peak in the OP soon. I have made a 1+2 configuration as well, but for some reason that suddenly stopped working. Also to figure out how to do flag decals, I made a place anywhere flag part. Enjoy. It's a great start! I like the overhead compartments. I'm not a huge fan of the textures, but I figure they'll improve over time. From a model standpoint, I think it would look better to extend the cockpit back another .5m and put the door there, rather than having it right below the pilot's seat. I'm sorry I didn't mention this before, but I didn't really see it clearly until the new screenshots. If you're going for an airliner vibe, I think that would feel more like an airliner to me. Yeah, don't forget to add the layers properly everytime, they cause the IVA to be wonky. Make sure your external cockpit export is properly oriented too, there's an issue where if it's not properly oriented, it will change it's orientation upon revert to launch. 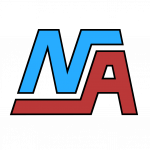 You can test it by, well, reverting to launch and see if it changes orientation using the navball. Who needs spacecraft, we've got Kerbin to explore! While you're still at this stage: Please, PLEASE, for the love of Krakensbane, do not integrate control surfaces into lifting surfaces they're part of, keep static surfaces and control surfaces as separate parts, integrating them makes them almost impossible to use with FAR. Thanks. @Bottle Rocketeer 500 I don't know how to read. I just read the post I was tagged on and the issue, saw the awesome pics and replied. My bad. Would you mind testing the curvy tail with far? It is supposed to be a smooth curve all along the fuselage. 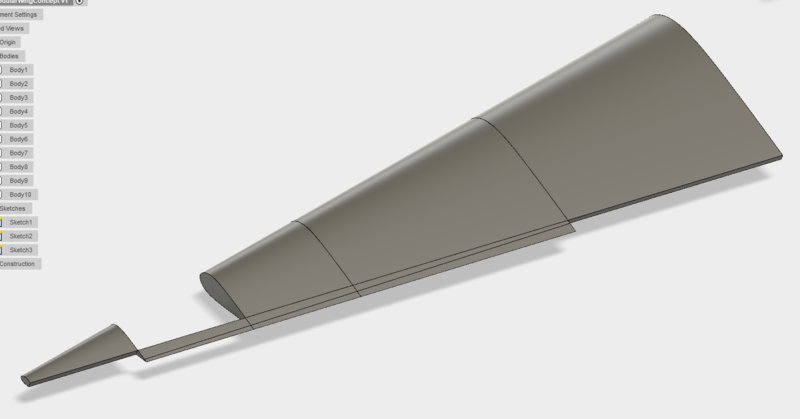 That is good for transonic design right? Mission accomplished then! 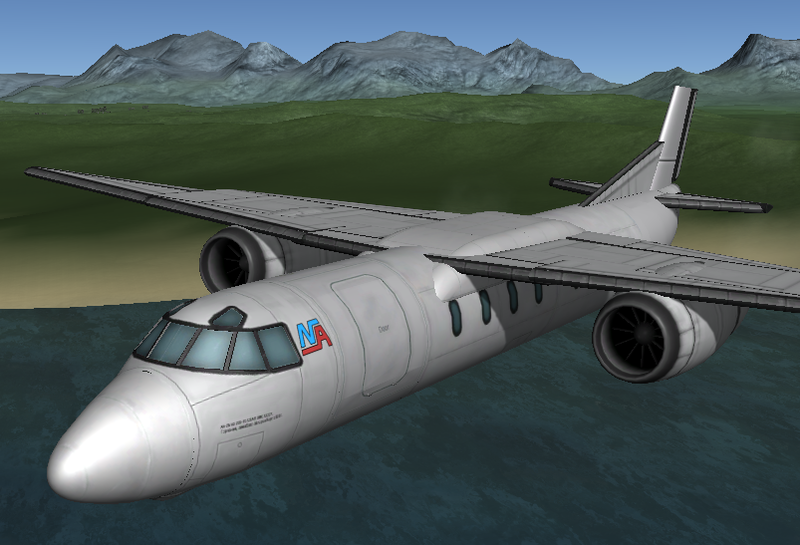 I am personally not quite happy with how the external model looks, as far as being a CRJ replica. From above the nose is to pointy, and form the side the curves are too "swoopy". The picture in the OP is kind of too far the other way, with completely straight edges. Right now I am focusing on figuring out a workflow to make stock alike textures though. For the last iteration I simply reused some textures from squad, and squished them into some shapes that I could use, but I am not quite happy with the results. Now I am thinking I will do the main design in Inkscape, then move to GIMP to add some grit and splotchynes to it. Made some textures from scratch today. Think I am on the right track for a stock alike look.